Now Gumroad supports paypal, but…? Last month, Gumroad announced that they finally started to support paypal option. I was really glad to hear that, since I no longer need to provide manual paypal supporting. Before this, I had to send the coupon code to each of those who paid via Paypal. It took time and Customers are asked to wait for some time, which is quite annoying for all. So it was super happy news and I discontinued my manual-Paypal-support. But some people are pointing out that the Gumroad’s Paypal process is not reassuring. It’s mainly because it asks you to “preapprove future payments”. 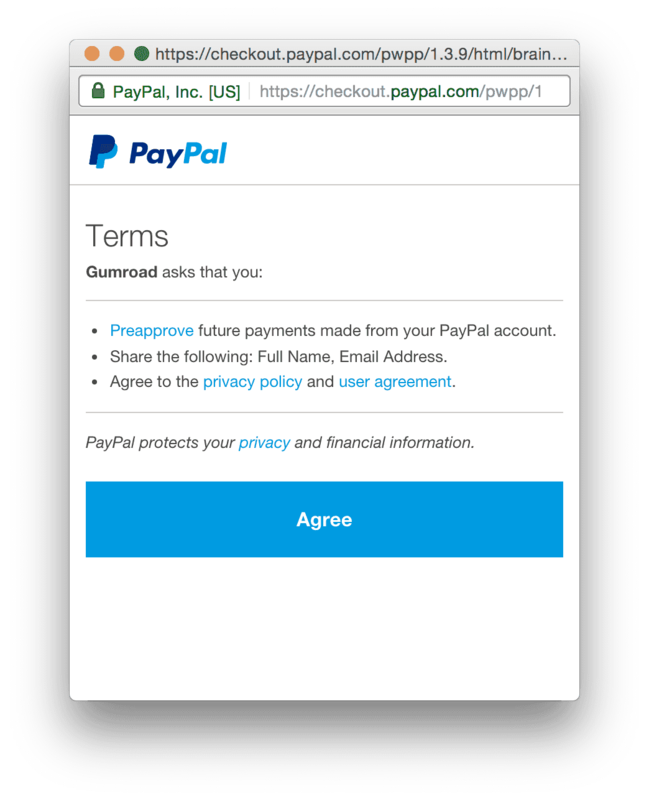 As I’m not a native English speaker, I’m not sure, but it can be interpret that Paypal makes some payments without agreement in the future? It’s natural that some watchful people think it suspicious. One thing I can say is that it’s not me but Gumroad who implement Paypal support. There’s no preference at all and I can’t help it. I googled it and found similar cases where the customer claimed this : Link. And this is the detail explanation given by Gumroad, posted there. It means that, if you were to come back to Gumroad, and use your PayPal account to buy another product, your PayPal account would have been saved (as a token – we don’t save any actual payment info), and you wouldn’t have to log into PayPal to buy a product. It’s the same as if you use your Facebook account as a way to login to, say, Yelp, or something. It seems that the “Preapprove” feature is to enable customers to buy other products in Gumroad without approving payment every time (to make it smooth to proceed checkout). I think; payment is significant thing for us all and it should take time to avoid any unexpecting payment, so preapproving feature is totally needless. Gumroad’s Paypal support started just a month ago and I think it will change according to user’s feedback. I’ll send them some message. For now, I can only declare that I’ll never trick anyone into paying more money than $15. If Gumroad allows us to do that kinda system (change the price afterward, and force customers to pay the balance or something), soon some vicious people abuse this and Gumroad would lose its credibility in a moment, so would Paypal. I think it’s unrealistic. I could re-set up a manual-paypal-checkout-button, but I don’t feel like doing that because I think it is what is thought uneasy. Customers pay $15 and get nothing until I send them a message! I think, for customers, Gumroad is much reliable than this obscure pink monster –even if there’s some strange policy. Anyway, the first action I should take would be talk to Gumroad about this. I’m so glad that over 50 people bought the Pokemod Skin. When it all gets stable, including such payment issues, I’m gonna post an announcement to U-he’s theme library, KVR and Gearslutz. 64DL will come soon and 128DL also not far. I’m happy. so did u success collect your payment via paypal? how it works? i am confuse too how to collect my money via paypal in Gumroad..